Genesis fully relies on her boyfriend Peter. He's her rock and she thinks their relationship is solid and forever. This changes drastically when Peter abandons her at Planet Parenthood. Genesis has to go through the termination of her pregnancy on her own without anyone who loves her by her side. This makes her question everything and everyone she knows. Genesis is going through a heavy crisis and she never expected she'd have to do this without Peter. Where did things go wrong between Genesis and Peter and how can she go forward when so much unresolved pain of the past is holding her back? Genesis can't fully control her emotions, she questions old friends and family and she makes new friends in a time when that might not seem to be the best idea. Will she eventually survive the traumatic experiences that keep piling up and can she trust on her best friend and cousin to pull her through? 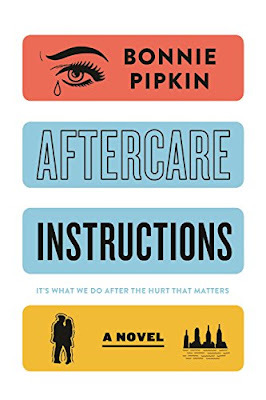 Aftercare Instructions is a fantastic emotional story. Genesis is a strong girl with plenty of talent, but her life is often tough. When she finally thinks she's found safety with someone he abandons her at the worst possible moment. My heart ached for everything Genesis is going through. I had tears in my eyes when I read her story and admired her determination to keep going. She might mess up from time to time, but she does the best she can. She slowly has to learn she can trust people and that she isn't completely on her own, which is a beautiful process to witness. Bonnie Pipkin combines regular chapters with flashbacks about Genesis and Peter in the form of a play. I absolutely loved that. It makes the story dynamic and it paints a very good picture of what's going on between them and what went wrong. I'm a big fan of the theater and I really enjoyed this aspect of the story. Aftercare Instructions is an incredible compelling and poignant book. I was impressed by the rawness and openness of it. I was also blown away by the writing and the thought-provoking subject is fantastic. I can't praise this story enough, it's absolutely brilliant and I highly recommend it. If you love emotional YA Aftercare Instructions is an absolute must-read. Hi, readers! I’m Bonnie Pipkin, a California-raised, Brooklyn-settled, red-lipstick-wearing, cat-loving, book-reading feminist. My first novel, Aftercare Instructions, came out in June of 2017, and it was the biggest dream-come-true moment of my life. I’m trying to write another one, but spending a lot of time making snacks and staring at the post it notes all over the wall in my office. But it’s slowly coming along. 2) Could you describe the main characters of Aftercare Instructions in six words each? 3) Part of your story is written as a play, what’s the inspiration behind this fascinating aspect of your book? I first wrote the novel with a straight through narrative and timeline. The story started while Genesis was having an abortion, and then comes out to find her boyfriend has left her. How to pick up the pieces from there and confront some things from her past to move on? Well, the consistent feedback I received was why would she still pine for someone who did something so horrible to her? So, I decided to add some flashback of how Genesis and Peter fell in love, and how he was there for her through some very tough times, making it hard for her to just let go even with his giant mistake. Then I started thinking about how we distill our memories into scenes, and sometimes when we look back, those scenes feel like a movie or a play. Then it clicked, and I went for it! 4) You write about several difficult topics, like broken families, addiction, abortion and suicide in a beautiful open way, how do you prepare to write deep emotional scenes like that? I think I’ve always lived my life with a kind of openness to the tough stuff. I am a person who is deeply empathetic and am easily moved to tears (ask my boyfriend: I cry in almost every episode of Chopped, which makes no sense). I’ve also always been a person with a big capacity to listen and take on people’s stories and pain. So, I think with writing, there’s a place that I can also go to when I’m trying to get to the emotional heart of a scene. It’s not so much preparing as it is giving in. 5) Your story is about the important people in someone’s life, those who care. What’s the most important thing about having a support network? It is about that, isn’t it? That comes directly from my own need and dependence on my friends and community. Like Genesis, I can sometimes be independent to a fault, but when I give in and remember that I don’t have to do it all myself, life is much sweeter. I don’t think I’d be anywhere without my support network. It’s an exchange. You have to give what you hope to receive one day. 6) Where does your passion for the theater come from? I’ve always been drawn to the magic of the moment with theater. How something that takes so much work and heart exists only to those witnessing, and then it disappears. Recorded theater is nothing like live theater. I get a lot of energy from both performing, and watching performance. New York may seem like a distracting place to accomplish something like writing a novel (and believe me, I do need my trips to the woods) but I have always found that channeling the energy and art of the city makes my work stronger. 7) Gen has a lot to overcome, but she’s stronger than she thinks. What do you like the most about her spirit? What I like most about her is that she probably could take care of herself, but she has to learn (sometimes over and over again) that life is actually better when you make yourself vulnerable and let people help. It’s hard when you experience loss to let yourself, but she never loses that. She’s tough, but not too tough. 8) How did your love for literature start and what do you like about teaching it? I’ve always been a reader. My parents are as well, and I imagine that’s where it started. There was always a big importance placed on reading in my family. I also wasn’t allowed to watch much TV (though I snuck it as often as possible). What I like most about teaching it is to move my students into becoming readers. College students are worn out and forget the joy of reading sometimes, but when I hand them books like The Absolutely True Diary of a Part-Time Indian or The Hate U Give, I witness the transition. They remember that reading doesn’t always have to be a chore. But my favorite part about teaching it is engaging in discussions about books week after week and getting paid for it! 9) You officiate weddings, can you tell a bit more about that? Sure! Well, I worked in wedding catering for many years, and watched so many weddings until it clicked for me that officiating combined a whole bunch of my interests: love, ritual, celebration, writing, public speaking. So, I got ordained and started my business: Dearly Beloved NYC (www.dearlybelovednyc.com). My side hustle that is deep, heart-filling work. I hope to keep writing books and teaching literature for the rest of my life! And sprinkle in a few awesome trips that involve delicious food. One very lucky reader of With Love for Books will receive a signed paperback copy of Aftercare Instructions. 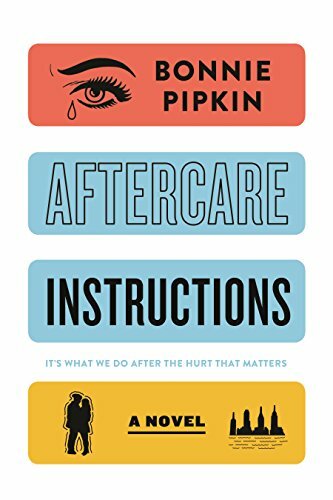 Aftercare Instructions sounds like a beautifully written story that is both moving and engaging. This is the first time I've heard of part of a book being a play, what a novel idea. It sounds so unusual and awesome too! I agree we can't get it all done without our support networks. I love your introduction of yourself! Intrigued by the book. Sounds like a lovely story, based on the effects of a young woman's decisions. 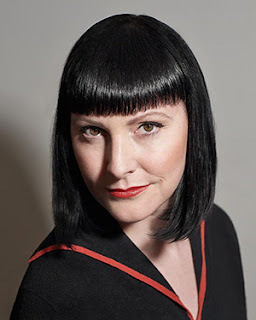 Sounds like another YA author to keep an eye on. Aftercare Instructions sounds like a very emotional read, I would also like the play written style. Sounds like a gritty read - Michelle Wild.